Ryan00: Thank you to all who completed the cache. Being inactive for a few months I thought I had already archived this. Apologies. Tassie doesn't have a wherigo cache so I thought i'd make an attempt at making one, let's see how it goes! A monkey from City Park has escaped! Help John the zookeeper find his missing monkey! This cache is Tassie's first wherigo cache! What better place to put it than Launceston's City Park? You will explore the different locations around the park, getting clues along the way to find your way to that sneaky, missing monkey. The starting location lacks parking, so you will need to either park around the corner or across the street. It should take about 20-30 minutes to complete, so it is significantly shorter than most other wherigos. Please also note that the monkey enclosure is only open from 8am-4pm, and is open until 4:30 during daylight savings. Cache is a small sized cache, but no room for swaps or a pen, so you will need to BYOP. At the cache location, there is no need to damage any plants to find the cache! Please let me know of any bugs/errors in the cartridge so I can fix them. [GZ:] tneqra orq, przrag pbeare. 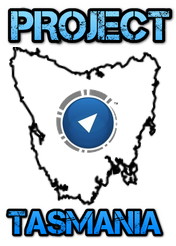 PROJECT TASMANIALet's put Tasmania on the wherigo map!